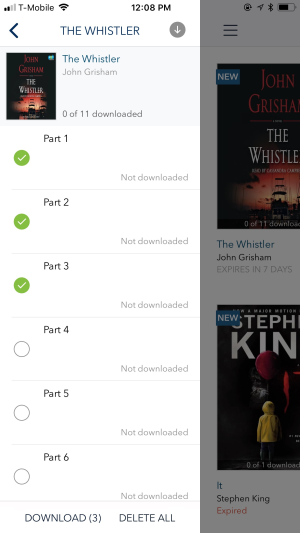 If you've tried downloading an audiobook to the app Bookshelf, but you get a prompt saying part 1 isn't downloaded, use the steps below to manually start downloading its files. Note: We recommend downloading audiobooks over a Wi-Fi connection since they are often large files that use a lot of data. Tap the audiobook you'd like to download. Tap Download all, or tap the individual parts you'd like to download, then Download. Note: To make sure audiobooks start downloading when you add them to your Bookshelf, turn on the "Automatic downloads" setting under Home menu > Settings. If the audiobook parts still don't download or don't move past "Waiting," use the steps below. 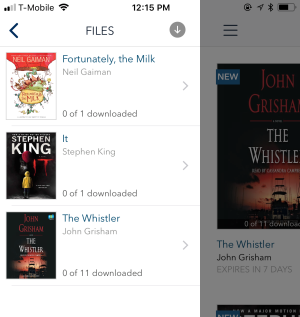 In the "Files" panel, tap the audiobook you're having trouble with.